The curriculum samples shown here represent critical topics we address at each grade level. "30 stamps are worth a total of $8.66. Some of the stamps are worth 32¢ each and the rest are worth 23¢ each. How many of the stamps are worth 23¢ each?" "Prove vertical angles are equal." "Find the diagonal of a rectangle whose length is 12 and whose width is 5." "Find the slope of the line that is perpendicular to the line 3x + 2y = 8." "What is the 10th term of the sequence 1, 1/2, 1/4, 1/8 ...?" "How many ways can 7 books be arranged on a shelf in groups of 5?" "Simplify (2 + 3i)/(3 – 4i)." "If sinA = 4/5, find cosA." "Express tanB in terms of sinB and cosB." "Sketch ƒ(x) = 2sinx + 3 over the domain -2Π to 2Π." "Verify that secA – cosA = sinAtanA." "A rocket is fired at sea level and climbs at a constant angle of 65° through a distance of 12,000 miles. What is the altitude of the rocket to the nearest foot?" "What is the domain and range of the function ƒ(x) = 3/(x + 1)?" "If ƒ(x) = 3x and g(x) = x + 1, find ƒ(g(x))." "Find the interest on $1,000 invested at 5% per year, compounded continuously." "What is the centre and radius of the circle whose equation is (x - 3)2 + (x – 4)2 = 9?" "Find the limit of ƒ(x) = 1/x as x approaches infinity." 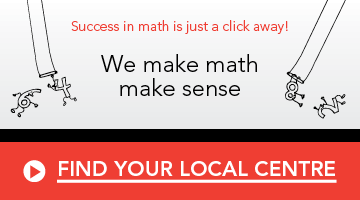 Learn more about our high school math program.